Straight From The Heart is what you get from the performance team of Lana Puckett and Kim Person. Passionate vocals, precision harmonies and impeccable guitar playing draw you in like a magnet. Lana and Kim have been described as a group having the "hush factor"-- they are polished musicians and warm and entertaining singer/songwriters. 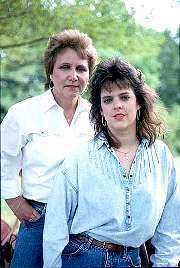 Their career together has garnered an impressive array of awards such as Best Traditional Female Vocalists for the state of Virginia, Country Vocalist Winners of the American Songwriter/Columbia Recording Artist Search, First Place Songwriter Awards from The Austin, Texas Songwriters Group and four time Kerrville New Folk Winners. They have toured extensively and shared the stage with Janis Ian, Pam Rose, Chuck Pyle, The Kingston Trio, Patty Larkin and numerous others. Their show consists of original songs and tasteful selections ranging from Contemporary to Traditional Country and Folk. Their songs speak of real life situations. Both are multi-talented musicians playing a variety of instruments. In 1999 their original song "Cornstalk Pony" was recorded by the legendary artist/writer Steve Gillette on his Texas to Tennessee CD release. Tablature and lyrics are also available in Steve Gillette's latest song book published by Compass/Rose Music.